Even as curbing greenhouse gas emissions becomes more urgent as the effects of climate change become more acute, fossil fuels will remain the largest source of GHGs far into the 21st Century as both global energy use and CO2 emissions double, according to MIT’s 2014 Climate and Energy Outlook. MIT’s report was published Monday following the United Nations Climate Summit in New York the previous week, when the Obama administration committed to greenhouse gas emissions cuts to be included in a treaty expected to be signed in Paris in 2015. The Paris negotiations will be known as COP 21, or the 21st Conference of the Parties to the UN Framework Convention on Climate Change. Any agreement that comes out of the Paris climate negotiations will direct any action taken on climate change after 2020, when previous agreements signed in Copenhagen in 2009 and Cancun in 2010 are set to expire. The Climate and Energy Outlook looks at how existing greenhouse gas cutting measures could be extended at COP 21 beyond 2020, using UN population and economic data to connect the dots between climate change, land use, water and socioeconomics. The world’s governments, meeting in Copenhagen in 2009, agreed to make efforts to keep global warming under 2°C (3.6°F) below pre-industrial levels, beyond which manmade climate change could become catastrophic. To do that, greenhouse gas emissions would have to be 40 to 70 percent lower than they were in 2010. The results of the report’s projections are sobering, if not surprising: Global energy use is projected to double by 2050 and most of that energy will likely come from fossil fuels, which, like today, are expected be the world’s largest source of greenhouse gases. So instead of slashing 2010 global greenhouse gas emissions levels of about 45 gigatons, developing countries are projected to be primarily responsible for nearly doubling them, reaching 92 gigatons by 2100 after rising to 77 gigatons in 2050, 85 percent of which will come from developing countries. Of the 92 gigatons of GHG emissions projected to be released in 2100, about 62 gigatons of them will come from fossil fuels — double the 31 gigatons of greenhouse gases that came from fossil fuels in 2010, according to the report. The share of emissions coming from developed nations will be cut in half by mid-century, to 15 percent in 2050 from 30 percent in 2010 if Cancun and Copenhagen promises are kept, the report projects. 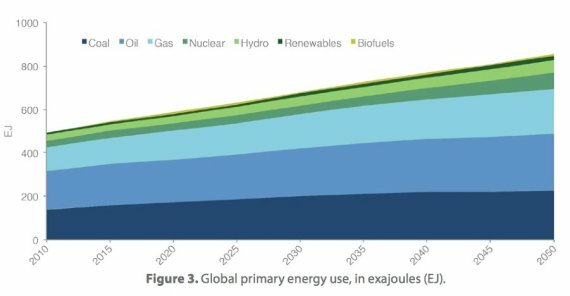 Worldwide, greenhouse gas emissions from electricity production and transportation will see only modest improvements with emissions from those sources making up 52 percent of the emissions from total global fossil fuel use in 2050, down from 56 percent in 2010. Renewables and nuclear power are projected to make up less than 20 percent of the globe’s energy sources by 2050, mainly because natural gas will become the primary source of energy for power generation worldwide, displacing coal. The report’s forecasts assume that the world’s developed countries will keep their Copenhagen-Cancun pledges, said the report’s lead author, John Reilly, co-director of the Joint Program on the Science and Policy of Global Change at MIT’s Center for Environmental Policy Research. “Ultimately, if the scenario we develop actually emerges, then the argument by some developing countries that developed countries must reduce (emissions) first will be rendered moot, as it is pretty clear that even if developed countries dropped to zero, global emissions and concentrations would continue to rise,” he said. The report says the upward global trajectory of greenhouse gas emissions from burning fossil fuels is clear as worldwide efforts to meet long-term CO2 emissions reductions goals are falling far behind. Drastic measures from developing countries that would change the trajectory of these trends away from reliance on fossil fuels are unlikely to come out of COP 21, Reilly said. Some countries are making progress, he said. China is moving ahead with emissions reductions goals, higher-income countries such as South Korea and Mexico are taking measures to reduce emissions, and Brazil has reined in deforestation. Other trends standing in the way of reducing GHG emissions include no widespread adoption of greenhouse gas pricing and inaction from Congress that is preventing the U.S. from showing leadership in reducing emissions, Reilly said. The conclusions of the MIT report are consistent with International Energy Agency forecasts and other recent projections of global energy use and GHGs, said Elliot Diringer, executive vice-president of C2ES, the Center for Climate and Energy Solutions, formerly the Pew Center on Global Change. “Accelerating the transition to a low-carbon energy system will require stronger policies around the world,” Diringer said, praising the Obama administration’s Clean Power Plan, which aims to slash CO2 emissions from existing coal-fired power plants in the U.S. There may be a scenario in which low-carbon sources of energy become more widespread through 2050. “In my view, the probability of a meaningful international climate agreement is greater now than it has been in 20 years,” said Robert N. Stavins, a professor of business and government at the Kennedy School of Government at Harvard University. His optimism stems from the legally enforceable protocol adopted by the UN for an international agreement on climate in Paris in 2015, and the more politically feasible framework for that agreement that combines emissions reductions that each nation believes it can achieve, coupled with outside emissions monitoring and enforcement, Stavins said. A quickly evolving combination of fuel sources for power generation across the globe also helps paint a more hopeful scenario for the future, Reilly said. Beyond that, renewables are being developed quickly throughout the globe, but the challenge is finding ways to integrate that energy into the power grid. MIT’s Energy and Climate Outlook is an annual report, produced since 2012, that provides an update on how economic growth and the use of natural resources are affecting the environment and climate change.